U.S. stocks advanced Tuesday, rebounding from the previous day's pullback, as investors geared up for key decisions out of Europe and from the Federal Reserve later this week. 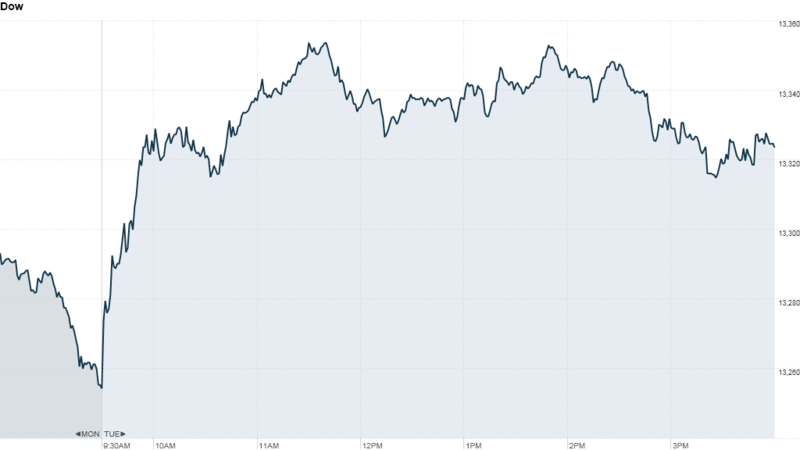 The Dow Jones industrial average rose 0.5% and the S&P 500 rose 0.3%. The day's gains put the Dow back at its highest level since December 2007, while the S&P 500 is within spitting distance of the multi-year high it reached last week. The tech-heavy Nasdaq finished flat. Financial stocks were among the biggest gainers, with JPMorgan Chase (JPM), Bank of America (BAC), Goldman Sachs (GS), Citigroup (C) and Morgan Stanley (MS) all finishing higher. Europe is also in focus ahead of Wednesday's ruling from Germany's Constitutional Court on the legality of the European Stability Mechanism, a permanent bailout fund that's expected to have a maximum lending capacity of €500 billion. Investors are waiting to see how the ruling may impact the European Central Bank's plans to preserve the euro, which remains near its highest level against the U.S. dollar since May. Global markets finished mixed ahead of the decision. "I think we'll see ratification, but it could come with conditions that would result in the diminution of its horsepower, which would be something the market is not prepared for," said Mark Luschini, chief investment strategist at Janney Montgomery Scott. On the domestic front, investors are waiting to hear whether the Fed will announce new stimulus measures when it wraps up its two-day policy meeting Thursday afternoon. It's expected that the weak August jobs report gives the central bank even more reason to enact a third round of quantitative easing. "There's a better-than-even probability for QE3, but it's not guaranteed," said Luschini. "We will get something." Luschini expects the Fed is more likely to alter the language of its current policy of keeping interest rates low through 2014. He said the central bank could either extend the date of its program, such as through 2015, or change the policy, from being date-dependent to state-dependent. For example, Luschini said the Fed could pledge to keep low rates until the unemployment rate decreases to a certain level, so that the market has a clear signal. In other markets, gold prices and oil prices moved slightly higher. U.S. Treasuries faltered, lifting the yield on the benchmark 10-year note to 1.70% from 1.68% late Monday. Companies: Hewlett-Packard Co. (HPQ) expects to lay off 29,000 workers over the next two years, which is 2,000 more than it had originally said. Shares of the PC maker gained almost 3%, making it among the leaders on the Dow. Digital Domain Media Group (DDMG), the company behind the Tupac hologram that was a hit at the Coachella music festival earlier this year, filed for bankruptcy protection Tuesday. Private investment firm Searchlight Capital Partners will buy the company's main operating unit, Digital Domain Productions, for $15 million. As a result of the bankruptcy filing, the New York Stock Exchange immediately suspended trading for the company's shares and delisted them from the exchange. Citigroup said it expects to book an after-tax loss of $2.9 billion from the sale of its remaining 49% stake in Smith Barney to Morgan Stanley. British fashion brand Burberry lowered its sales guidance for the rest of the year Thursday, in another sign that the global luxury market continues to lag. Shares of Tiffany & Co (TIF)., Coach Inc (COH)Ralph Lauren (RL) were lower on the news. Legg Mason (LM) shares spiked 5% after the company said CEO Mark Fetting will step down at the beginning of October. The company has been facing activist investor pressure as it struggles to attract funds. In fact, Legg Mason assets under management have been declining since 2008. Shares of Facebook (FB) rose modestly Tuesday. After the closing bell, CEO Mark Zuckerberg hits the stage for an interview at the TechCrunch Disrupt conference in San Francisco. Economy: The Census Bureau's July report on the U.S. trade balance showed a deficit of $42 billion. Analysts surveyed by Briefing.com were expecting a $44 billion deficit.